Chiclayo is a city on the northern coastal plain in Peru. It is 95 feet above sea level. The city population is approximately 634,600 while the metropolitan area is approximately 910,255. Chiclayo was founded in 1560 as a rural Indian village by a Spanish priest. 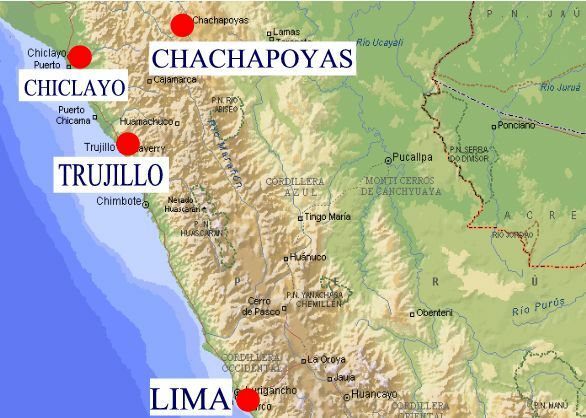 Until the 19th century, Chiclayo remained a small town in comparison to the nearby city of Lambayeque. 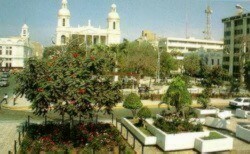 However, the city of Chiclayo has since grown to become a major modern metropolis. It is Peru's fourth largest city. Since the city is located in a productive valley, there is strong agriculture, such as rice production, sugar cane and cotton. Until Peru's economic decline, the port of Pimentel served as Chiclayo's main export line; sugar refined in Pomalca passed through Chiclayo by train and was exported to various desinations along the Pacific Rim. However, with the socialization of agriculture, and subsequent demise of the Peruvian economy, Chiclayo ceased to export by sea. Economic prosperity did not leave, however. With the construction of the Panamerican Highway, the city became a center for commerce, due to the fact that it has easy access to mountain passes that allow access to the jungle, as well as being close to the sugar cooperatives. The North of Peru is rich and full of interesting places such as Trujillo, Chiclayo and the lost world of the Chachapoyas. The Pre-Columbian Chachapoyas culture, conquered in the 15th century by the Incas, has left a landscape scattered with villages and burial sites which until recently had been largely overlooked by archaeologists. Situated in the cloud forests around the town of Chachapoyas in Peru’s northern Amazonas Department, these sites are dominated by the mighty fortress of Kuelap, perched majestically atop mountain-top cliffs overlooking the verdant Andean landscape. In Chachapoyas, remnants of the past invite discovery by the bold adventurer, and the cultures of the present extend a friendly welcome. The pyramids of the Sun and Moon, just south of Trujillo, are the largest structures ever put up in South America, and are second in the Western Hemisphere only to the Pyramid of Cholula, Mexico, in size. They formed the spiritual center of the Moche Empire, a highly sophisticated yet mysterious culture that pre-dated the Incas by nearly 1000 years. It is quite certain that the Moche Indians had contact with other civilizations in the ancient Americas, and there is good reason to believe they may have been influenced by Asian ocean- going voyagers as well. The Pyramid of the Moon contains a central, vaulted chamber, and the mountain directly behind, Cerro Blanco, appears to have been shaped by humans into a pyramid form as well. Despite their achievements in architecture, metal-working, and ceramics (one can still find countless pottery shards in the sands surrounding the site), the Moche were very militaristic, and scenes from their pottery depict ritual bloodletting and torture. They may have evolved a system of “black” magic that aided them in their conquests of neighboring peoples, or they may have taken spiritual teachings from Asia and twisted their meanings into bizarre new practices over the centuries. Huanchaco is a fishing town where “caballitos de totora” are still used by the local inhabitants, who venture into the cold currents of the Pacific in these precarious-looking reed boats. This massive adobe city, really a series of royal compounds built by the Chimu, was a major source of gold for both the Incas, and later, for the Spanish. Though well-looted over the centuries, gold artifacts still occasionally appear in the drifting sands. Contacts between Chan Chan and the Asian continent have never been proven, but there are tantalizing hints. Pottery figures depict Asiatic men with beards and turbans; even the name “Chan Chan” seems to be Chinese in origin. Don’t miss the famous “honeycombs,” where strange acoustic effects allow visitors to whisper to each other over long distances inside the adobe structures. Also visit The small city of Huaráz, the hub for all hiking activity and Chavin de Huantar, the most representative Ceremonial center of the high Peruvian Culture with 3000 years older, Chavin is considered to be the first high Peruvian Culture. Lost Cities of Northern Peru 6 days and 5 nights Lima, Caral, Chavin de Huantar, Huaraz, Trujillo, Chiclayo, Tucume, Moche.